We offer conformation training for both dog and exhibitor on a limited basis. Please call or e-mail for rates and availability. in Greenville, SC on 7/26/03! 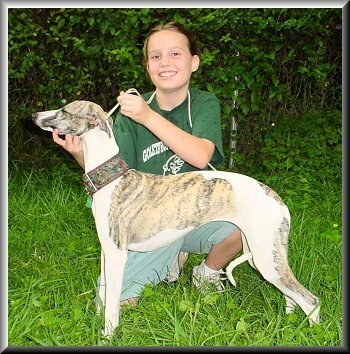 Megan is our Junior Handler in training. Megan started out her new carreer with a bang at the Sanctioned B match in Fletcher, North Carolina. Megan took third place Junior in her age group out of 7 experienced juniors. Megan exemplifies the talent and dedication required to become a top Junior Handler and we couldn't be more PROUD to assist her in her quest! Watch for Megan to make her first Junior debut at the Greenville, SC shows on 7/25-7/27!